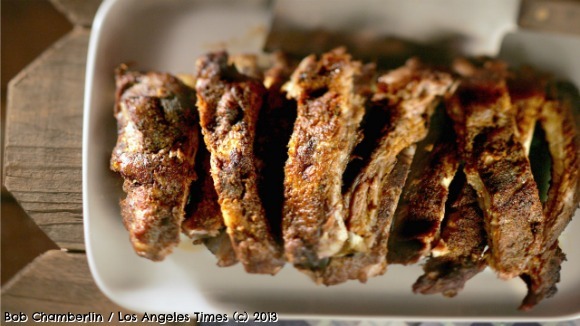 I met up with Chef Noelle Carter, Director of Los Angeles Times Test Kitchen, to go Whole Hog and get a sample of what’s in store for her Labor Day Block Party at The Taste. Watch the video and learn how easy it is to make Hickory Smoked Baby Back Ribs indoors! Chef Noelle heads up the Labor Day Block Party this Labor Day Weekend with a line-up of celebrity chefs not to be missed: Nancy Silverton, Evan Kleiman, Ryan Chester, Diego Del Pino, Fred Eric and Steve Lopez. The family friendly event takes place at Paramount Pictures Studios and kids ages 3-12 get in for $5 each. The theme of the afternoon is Going Whole Hog and will focus on everyone’s favorite summertime cuisine and pastime… BARBECUE! 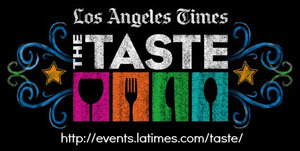 To purchase tickets and get more information, please visit events.latimes.com/taste. 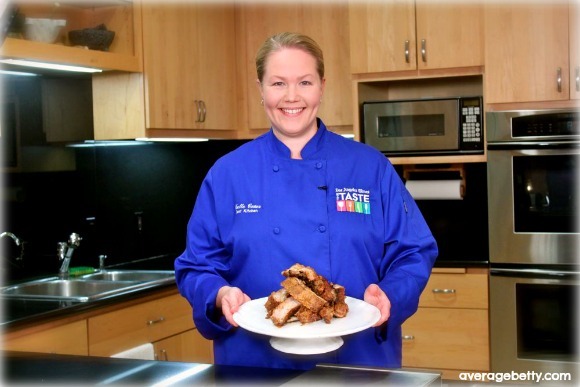 Get Noelle Carter’s Hickory Smoked Baby Back Ribs Recipe as seen in the video. WATCH MORE FUN FROM THE TASTE! Food Editor in Chief Russ Parsons, Zucchini Rafts, Beards and Bacon. Yes. You read that correctly. We talk street food. We tell secrets. And by we I mean me and chefs Giada De Laurentiis, Scott Conant, Jet Tila and Fabio Viviani. Betty Hallock and Rene Lynch of Los Angeles Times entertain my shenanigans and there’s even a special appearance from Aarti Sequeira! Team AverageBetty covers the inaugural Los Angeles Times Celebration of Food & Wine and scores interviews with Suzanne Goin, Russ Parsons, Aarti Sequeira, Noelle Carter and Ree Drummond! Special thanks to Daniel Silva Rego, Diana Hossfeld and Hillary Manning. I haven’t seen this technique before but it looks dead simple. I am enjoying using my electric smoker outdoors right now but when the weather shifts to 20 below this technique will have a lot of appeal.